After a midweek cigar session, see last post, it was always going to be a decent cigar weekend too as long as the weather played it’s part and thankfully it did. I am going to take the cigars in reverse order as one is a proper review, or as proper as you’ll find here, and the other but a passing comment or two. So “first” up is a bit of a big boy – Partagas Salomones – which measures 57 x 184. It is in factory terms a double perfecto with box code POL MAR11, so young but not infanticide. 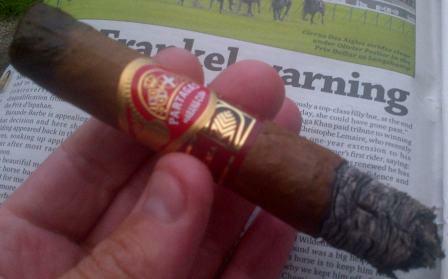 This was a proper sunday afternoon smoke accompanied by a couple of pints of Guinness in the back garden with a note pad and the Sunday Racingpost. I didn’t have a bet in the “Arc” thank god as I’d never have picked the winner. Draw & Construction – Wrapper ok if not an excitingly good example. Aroma a little honeyed and generally mellow, a little loose on the draw but then I find this shape, if not size, can be plugged so this was a sort of relief. Opening – Decent enough, leathery and straight into stride (not necessarily a good thing in a decent sized smoke like this), hay-like notes, initial thought was “a little light-weight” for a Partagas. First Third – Mellow still, hay, straw and light tanned leather. Little or no spice. No real density to the smoke but lots of it. Burn very good and even, in fact it never required a touch up at all. I noted that it was just a touch, safe or even dull, where is the “animal”? May be the tobacco just wasn’t great in this. Second Third – In general too loose a draw to be a cigar of real substance. The leather profile continued but in the same way that a mature wine can be it made me feel it was a little “dusty”, a little less than 100% clean. I was already reserving the rite to try another before really drawing a conclusion. A little black pepper spice did appear . There were elements of a pretty average SDN4 appearing which was a positive sign in a way. Just at the end of the notes for this section I observed a little nuttiness. Third Third – No real change here from above although the slightly loose draw did catch up with it a tad. Conclusion – Sadly the one thing this section should be, but this isn’t, is conclusive. I was left a little confused. On the plus side there is a bit of theatre about this sort of size and the burn was good. On the down side it is in danger of being no more that an novelty. The profile does not smack of Partagas and there was a tendency towards dullness and a lack of concentration. A smoke doesn’t need to be heavy or strong (to the contrary on many an occasion) but this lacked definition and character. The only conclusion is that I should try another, I have 4 more so that is not a problem. 87-88 (??). 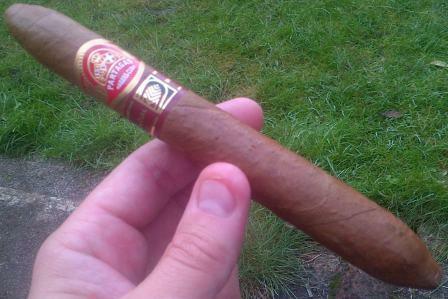 The weekend’s other smoke was very different – Quai d’orsay Coronas Claro – measuring 42 x 142. A smallish Coronas with box code OGA NOV 2011. This was not heavy but had real depth and density and dare I say it…class. A slightly tight draw and years ahead of it. It was a little muted but very refined. Everything about it just made me think, give this 12 months and then the depth will become elegance. It is rare that I think of buying a box of the back of just one cigar but this made me think just that. it could be the perfect mid-morning or mid-afternoon smoke in 2-5 years. I must try more Quai d’Orsay.